Being a Mets fan, I've avoided paying a visit to our biggest division rivals over in Philly since I started this goal of visiting every Major League ballpark. Philly sports fans (or should I say phans) have a reputation for unruly behavior and starting fights just about anywhere they go. My first experience of such fanaticism was at the Mets second ever game at CitiField in 2009 against the Phillies when the Mets scored a home run and my friends and I had beer thrown at us for standing up and cheering. So, needless to say, I was a bit hesitant to make the journey over to Citizens Bank Park. When I went to Yankee Stadium last summer and almost left the park before the game even started because of such horrendous treatment on the part of just about every single person at the stadium, someone left a comment on my blog telling me that if I was going to have that attitude about every team I dislike, that I shouldn't bother visiting every park at all. Well, let me tell you something, I don't have that attitude about every ball park and I loved Citizens Bank Park. We didn't have the best seats, but they were $9...can't beat that! See, I don't understand the Yankees/Mets rivalry. There is no such thing. We play each other all of 2, maybe 3 times a year in Inter-League play (which should be done away with) and it doesn't count so whenever I wear a Mets shirt on the subway and some Yankee fan tells me I'm rooting for the wrong team, I just don't get it. Now, the Phillies/Mets? That's a rivalry. The rivalry is arguably one of the hottest in the National League (as is often depicted by some rather violent pictures of Mr. Met and the Phanatic beating up on one another). When I got home from DC on Wednesday afternoon and The Pilot picked me up from the airport, we decided to make our way to Philly for the night to catch the Phillies/Nationals game (an up and coming rivalry within the National League). As I've been going from ball park to ball park, I've been rating them from best to worst based on a number of factors: the actual stadium itself, the hospitality of the stadium's staff and employees, the fan base, the food and overall experience. So far, Pittsburgh's PNC Park is my favorite park. I knew Citizens Bank Park would be different as soon as we got there. Driving into the parking lot, the young man who we paid for parking was one of the friendliest people I've ever talked to. He greeted us with a huge smile, thanked us for coming to the game, asked us how we were doing and told us to enjoy ourselves. We grabbed some food and beer and hung out at ballpark's beer garden before making our way to our seats. They had a great selection of beer and while enjoying our drinks before the game started, we started talking to an awesome guy about the game. When he saw my boyfriend's hat, he made a few, friendly jokes about us being Nats fans, but when we told him where our loyalties actually lied, he pretended to call security (all in good fun of course). Then he said, "Well let me be the first to officially welcome you to the Phillies ball park" and spent the next 10 or so minutes telling us all about the park, asking what we were doing there and recommending the best food and drinks in the park. Philly fans? Unruly? Definitely not. The ballpark was very family-friendly and we had a blast! We stood in line for an inning and a half for the oh-so-famous and oh-so-fabulous crab fries, got some Turkey Hill ice cream in a helmet cap and watched the Phillies blow the Nationals away. In a near relationship-ending move, The Pilot bought himself a Phanatic. We had a great time and the stadium is beautiful...not to mentioned packed, which was really surprising for a Wednesday night game that called for thunderstorms. I think I might even consider it one of my top 10 favs but hey, I'm only at already at 16...which means I'm more than half way there! 16 ballparks down, 14 to go! Let's see which one will be next! 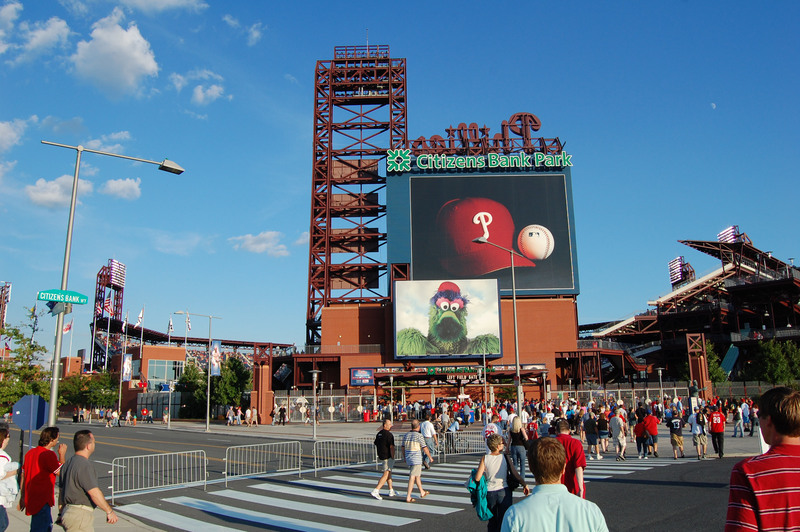 Have you been to the Phillies stadium? Or, have you been to the stadium of your rival team and liked it? I say WAHOO to Philly!! I just posted about my trip to Pittsburgh yesterday and I felt the same way about most of the fans--not crazy people and no one really heckled us for being Cleveland fans! Pittsburgh really isn't our rival in baseball, but I loved their stadium. I'm glad you liked this stadium, I have to make it there some day! !